The Whistler Grocery Store is not currently offering a discount through the Consumer-Direct Program. Groceries, specialty and organic foods in Whistler delivered right to your door. If you've arrived in Whistler without a car, or are too tired to make it to the store, The Whistler Grocery Store offers a quick and easy ordering system. You'll receive free delivery on grocery orders over $100. Learn more about the Whistler Grocery Store, scoop your Whistler groceries deal now, or get useful Whistler accommodation info if you are still researching Whistler lodging. Order $100 or more worth of groceries, and receive free delivery! Quote your consumer-direct discount code for The Whistler Grocery Store when placing your order with them. Scoop consumer-direct discount codes immediately for this and other top Whistler activities by subscribing to our free Whistler newsletter. Thousands of other Whistler visitors are enjoying these discounts, local tips & updates. The newsletter is delivered 6-12 times annually. You can unsubscribe at any time. Get Whistler Deals and Discounts! Submit your email and we'll send you an exclusive Whistler savings booklet containing discount codes for various attractions and activities. After a long day of traveling, the last thing you feel like doing is hitting the busy grocery store for your basic necessities. 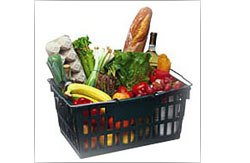 With the Whistler Grocery Store, pick and choose your groceries and have them delivered to your rental property. The available items include fresh fruit and vegetables, deli meats, bakery goods, pet supplies, organic options, and recognizable name brand products. If you're in the mood for an apres-ski cocktail, the Whistler Grocery Store can make a stop at the liquor store and add it to your delivery bundle. The Whistler Grocery Store services don't stop at the provision of groceries, they also offer gift services and catering referrals. Depending on the nature of your gift, the Grocery Store can prepare a fruit basket, a coffee assortment or a French-themed picnic for you, and guarantee same day delivery. If you know you'll be hosting a party while in Whistler, pre-order your groceries and have them ready for you when you arrive. Need Whistler Accommodation? Try a Search Now! If you have not yet booked your Whistler lodging, start your research by searching at the top of this page and tap into our direct reservation site, which features hundreds of top-located Whistler vacation homes. Our search is fun, friendly, easy and FAST. View theexact propertyyou will stay in before you book it online (as opposed to a "example" of what you might get)!